David Stanoch has drummed professionally since age 12. He has an eclectic musical reputation including work with recognized jazz, rock, R&B, Broadway, motion picture and television artists, including Hiram Bullock, George Clinton, Sheryl Crow, Richard Davis, Stanley Jordan, Keb' Mo, Minnesota Orchestra, New Kids On The Block, Bonnie Raitt, Doc Severinsen, Ben Sidran, Timbuk 3, Butch Vig, and The Supremes' Mary Wilson. He is currently musical director for Emmy-winning vocalist, Shaun Johnson's Big Band Experience. A 25 year faculty member of the McNally Smith College of Music, in St. Paul, MN, Stanoch is a member of Modern Drummer’s Educational Team, author of the book, Mastering the Tables of Time, Vol. I (Winner: #1 Educational Book," Modern Drummer 2009 Readers Poll), co-author, with Elliot Fine, Walfredo Reyes, Sr. and Mark Powers, of The 2 in 1 Drummer (nominee, DRUM! Magazine 2014 Drummie Award) and also serves on the PAS Drumset Committee. 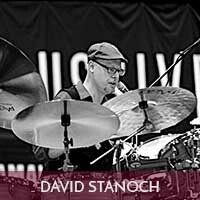 Stanoch conducts masterclasses at events including PASIC and NAMM, and performs with college ensembles, dedicated to inspiring young musicians with the same passion he drives bands with from his drumset. David proudly endorses the fine products manufactured by Yamaha Drums, Paiste Cymbals, Remo Drumheads, Vic Firth, and LP.